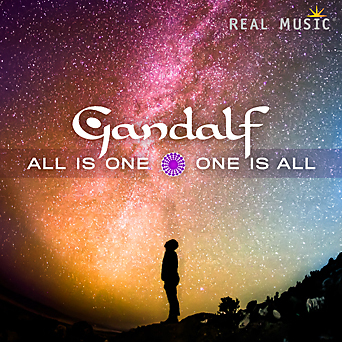 After a brief 1:16 prelude, “The Secret Inside,” track 2, “From the Depth of the Earth” establishes the environment that listeners will exist in over the course of Gandalf’s latest release, All Is One - One is All. Next “Starshine of Ever” rises and falls, utilizing minor shifts and changes taken over the course of 7-plus minutes to establish a cohesive entity. A piano and cello intensity pushes each element to a nice plateau, giving listeners a narrative voice to appreciate. “Where Longings Are Born” has an intricate opening that immediately draws listeners in, with distinct musical efforts filling in the composition. The depth and density of the effort ensures that one will have to play the song numerous times before hearing each inclusion and dynamic established between the instrumental efforts. “Where Wishes Come True” is the shortest, non-prelude/interlude effort on the album, but Gandalf has included such a rich panoply of notes, movements, and distinct elements that the effort possesses as much gravitas as any other effort on the title. “The Tree of Life” is a late-album effort, contributing tons to the overall sound of the disc. The deliberate percussive elements that punctuate this track ratchet up the momentum of the latter half of All Is One - One is All, ensuring that listeners will be on the edges of their seats until the album concludes. “And Music Filled the Spheres” is the final composition on All Is One - One is All, and it provides listeners with a great conclusion for the different twists and turns that they had experienced through the entirety of the album. The composition is a must-listen as it provides fans with an idea where Gandalf may go on follow-ups to this disc.